The study is the first of its kind to look at how leopards respond to the presence of both tigers and humansLeopard in Chitwan, Nepal simultaneously. 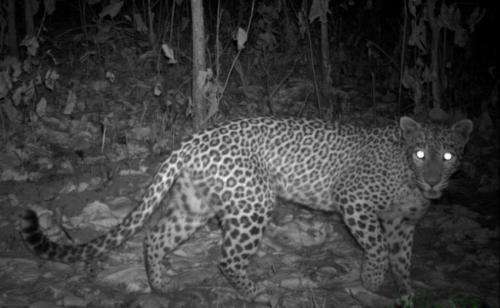 Its findings suggest that leopards in and around Nepal's Chitwan National Park avoid tigers by seeking out different locations to live and hunt. Since tigers—the socially dominant feline—prefer areas less disturbed by people, leopards are displaced closer to humans. Though they may share some of the same spaces, leopards avoid people on foot and vehicles by shifting their activity to the night. A scientific paper based on the study, led by Neil Carter, postdoctoral fellow at the National Socio-Environmental Synthesis Center (SESYNC), was published this week in the journal Global Ecology and Conservation. In addition to Carter, the co-authors are Micah Jasny of Duke University, Bhim Gurung of the Nepal Tiger Trust in Chitwan, and Jianguo "Jack" Liu of Michigan State University. "This study shows the complexity of coupled human and natural systems," said Liu, director of the Michigan State University Center for Systems Integration and Sustainability. "It also demonstrates the challenge of conserving multiple endangered species simultaneously." Most areas where leopards and tigers co-exist are human-dominated. Accounting for the multi-layered interactions between leopards, tigers, and people is therefore key to understanding the ripple effects of human activities such as conservation actions, the researchers say. The study has important implications in light of the Global Tiger Recovery Program, which is committed to doubling the worldwide tiger population by 2022. As tiger populations—and the territories they occupy—grow, leopards are increasingly likely to be pushed into areas where people live. The jostling of wildlife occupancy may open the door to more conflicts between people and leopards that could include leopard attacks on both people and livestock, as well as retaliatory killings of leopards. The researchers' findings underscore how successful conservation efforts need science that takes into account the complex feedbacks between humans and nature. "We want to see increased tiger numbers—that's a great outcome from a conservation perspective. But we also need to anticipate reverberations throughout other parts of the coupled human and natural systems in which tigers are moving into," said Carter, "such as the ways leopards respond to their new cohabitants, and in turn how humans respond to their new cohabitants." 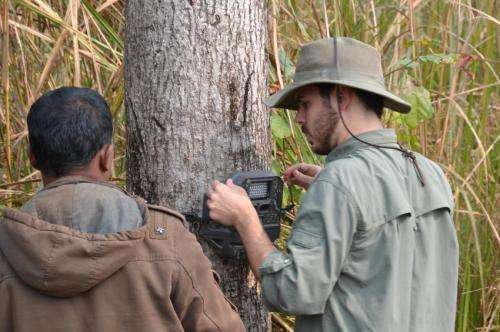 While working on his doctoral degree at Michigan State, Carter spent two seasons setting motion-detecting camera traps for leopards, tigers, their prey, and the people who walk the roads and trails of Chitwan, both in and around the park. Chitwan, nestled in a valley along the lowlands of the Himalayas, is home to high numbers of leopards and tigers. People live on the park's borders, but rely on the forests for ecosystem services such as wood and grasses. They venture in on dirt roads and narrow footpaths to be 'snared' on Carter's digital memory cards. The roads also are used by military patrols to thwart would-be poachers. Analyses of the thousands of camera trap images begin to tell the story of who is using which spaces and when they're using them. Sometimes, though, 'seeing' isn't enough. "People who use camera traps and other kinds of related monitoring tools realize there's a possibility that the animal is there, but you just didn't detect it," said Carter. "For example, your area of interest may be too large to set up cameras everywhere. Or, it's harder to detect animals in certain forest types if there are a lot of leafy trees blocking the camera's field of view—even if the animal is right there." 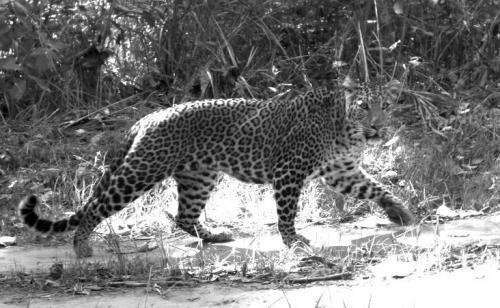 Because traditional field-based research can be logistically restrictive, time-intensive, and expensive, the researchers used cutting-edge computational models to fill in data gaps and statistically estimate the location and timing of leopard-tiger-human activity. "The computational component of this research is essential since it allows us to make strong inferences about leopard behavior in Chitwan based on a small sample," said Jasny, who spent an internship at CSIS working on the leopard-tiger-human data with Carter. Carter says that while there are many models that look quantitatively at the relationships amongst ecological components of an ecosystem, those models rarely consider humans. Integrating human activity adds a layer of real-world complexity that is more representative of the ecosystem as a whole—providing insights that can help researchers better understand how people and wildlife mutually influence one another.